Narwhals live farther north than most marine mammals, well above the Arctic Circle. They are whales of the Monodontidae family. Like all whales, they breathe air. Narwhals spend much of their time under sea ice, a near-permanent feature that far north. Regardless of the ice, they must surface regularly to replenish their oxygen supply. The “unicorns of the sea,” so called because of the long, spiraled tusks male narwhals grow, can sustain dives of up to 20 minutes in duration. Between dives, the animal lies still at the surface, rising to inhale and then lowering beneath the surface with its blowhole closed. After a moment, the stationary narwhal will exhale explosively and resurface to inhale again. Narwhals repeat this process several times, rising higher out of the water each time. With the final rise the whale pushes far out of the water before diving as deep as 5,000 feet. A complex network of blood vessels and the ability to hold large amounts of oxygen in blood vessels and muscle tissue sustain the narwhal on these deep dives. Although narwhals can travel for miles under the ice between breathing opportunities, they must surface regularly. They do so using cracks in the ice called leads. Narwhals can create their own leads if necessary and are capable of breaking holes in ice several inches thick using their heads or backs. They also use leads previously made by arctic seals. 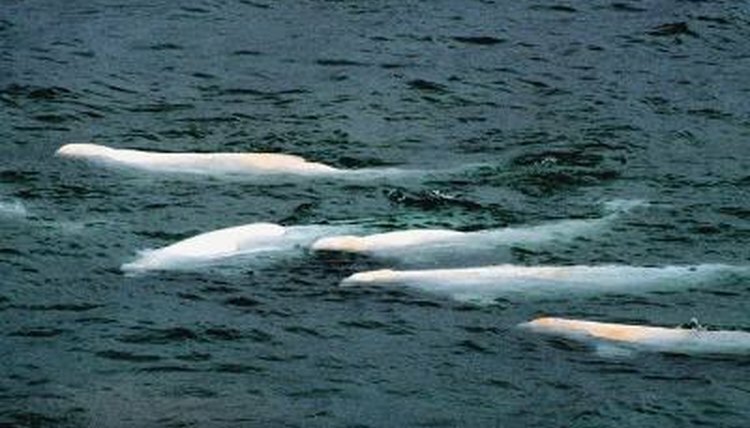 Bottlenecks occur in naturally occurring instances of open water between sea ice as well as in the narwhal-made cracks, as large groups of migrating narwhals queue up to breathe. Narwhals migrate following the shifting sea ice, which forms a sort of natural conveyor belt moving the whales along. Hundreds, even thousands, of narwhals will migrate together. With all of these whales depending on relatively small and infrequent ice cracks to surface and breathe, some become trapped around the breathing holes and suffocate to death while waiting their turn. Still others manage to surface but become prey for polar bears or human hunters who stalk these spots. The effects of climate change on the sea ice’s melting and freezing cycles alter narwhal migratory behavior, causing them to leave their summering spots later in the season. With a sudden shift in wind, a change in sea currents or a quick drop in temperature, previously available leads may suddenly freeze over and close. The narwhals below will become entrapped beneath the ice and could potentially die. This is a natural danger that comes with life in the harsh Arctic environment. Occurrences of narwhal entrapment have been documented for more than 100 years. Narwhals today run a greater risk of entrapment because ocean warming causes them to spend longer in summer locations before migrating. As a result, by the time narwhals arrive in winter locations, the pack ice is much thicker, meaning fewer leads. How Often Do Dolphins Come Up to Breathe? How Do Marine Animals Communicate in Water? Are Polar Bears Dependent on Ice in Their Environment? What Continents Do Polar Bears Live on? What Kind of Special Skills Does the Polar Bear Have? What Do Whales Do at Night? What Oceans are Sperm Whales Found In? How Fast Can an Elephant Seal Move on Land? What Are the Orca's Defenses? How Do Seals Survive in Antarctica?